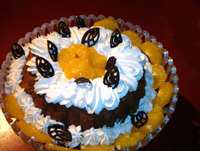 An orange flavored cake, with orange soaked raisins, baked in a bundt pan and soaked while still warm in an orange juice and rum syrup. Totally sinful. A rich pound cake flavored with coffee, baked in a bundt pan and soaked while still warm in a coffee and Irish whiskey syrup. What more could you ask for on St. Patrick's day? Rich French sweet pastry, made in a saucepan and rolled out between saran wrap while still warm, filled with a creamy egg custard and peaches and then baked. A total melt in the mouth experience to taste this while still warm. The same sweet pastry as above, filled with a chocolate filling that can only be described as a gooey brownie, rich, dark and more-ish. A graham cracker crust filled with a rich chocolate egg custard and finished with whipped cream and grated chocolate. Jello pudding never tasted like this. A Nicaraguan dessert of bananas baked with cream cheese, butter, cinnamon and coconut milk. Even if you think you don't like coconut, you have to try this. Heaven on Earth. A graham cracker crust filled with a rich homemade butterscotch egg custard, that can be finished with meringue for sheer indulgence or just served with cream for the lighter touch (who are we fooling?). Rich French sweet pastry, made in a saucepan and rolled out between saran wrap while still warm and filled with a mixture of apples, craisins, apricots and topped with a cinnamon-nut streusel. The same French pastry but this time placed on top of sliced apples and a brown sugar, butter and cinnamon mixture to look just like the French desserts they show in the fancy Gourmet magazines but made easy. The same French pastry but with a cherry filling and an almond and coconut macaroon topping that gives you a burst of texture and taste sensations. An update on a classic. Straight from an English nursery, and still lusted after by many men who remember this from their childhood. Rich challah bread (to be really evil) soaked in a rich egg custard with the addition of chocolate chips, baked until it is crunchy on top but meltingly soft and smooth under that crust. Homemade quick and easy yeast dough, that is encased in a butter, brown sugar and cinnamon mixture, baked and drizzled with cream cheese frosting that reminds me of Ben and Jerry's vanilla ice cream. They believe in using the 'real stuff' and so do I if you want the real flavor. This is not meant to be an every day treat. An Australian classic created to honor the Ballerina Anna Pavlova. Don't be fooled by books that say it is just a meringue. It is not. Inside that crisp exterior is a meltingly soft meringue that looks like fluff but certainly doesn't taste like it. 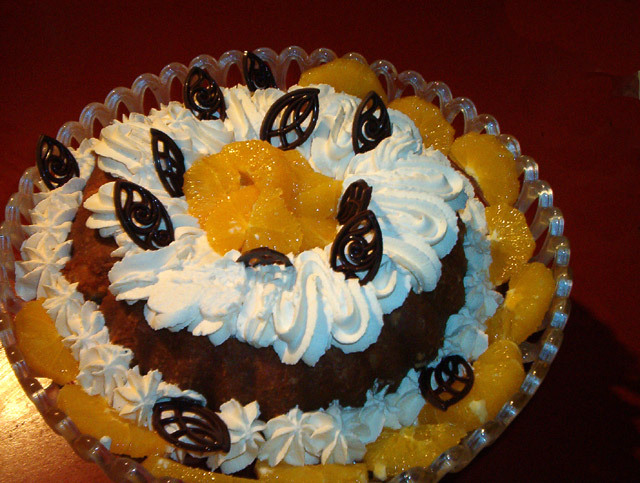 Topped with fresh cream and fresh fruit. This can't be made in humid weather. Similar to a Pavlova because it is based on a meringue but this has ground toasted nuts folded in and is cooked to thin, crisp layers that are filled with cream and fruit. This can't be made in humid weather. This is truly an Indulgence. Take a 9" pie plate with a ground pecan crust, lightly spiced with cinnamon, filled with a rich chocolate truffle sauce. Refrigerate it while you make the creamy caramel sauce which is then poured all over the chocolate filling and then finished with whipped cream. Incredibly rich so you know you should stop eating it, but it tastes too good to leave any. (from Emeril Lagasse on GMA and it does work) a peanut butter/graham cracker crust, filled with an almost cheesecake mix of cream cheese, peanut butter and melted chocolate and garnished with whipped cream and grated chocolate. My son was eating it for breakfast Easter weekend - as if he didn't have enough chocolate!